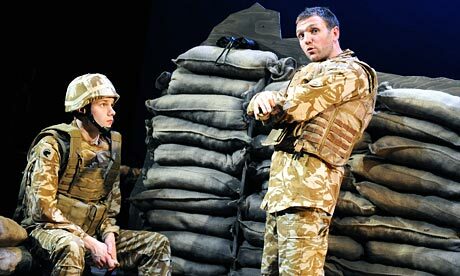 The day I booked my first ticket for The Great Game – a series of twelve half-hour plays spread over three nights, or run consecutively at weekends – I picked up the paper to see the ‘last’ US soldier was leaving Iraq. Many of those retreating were heading on to Afghanistan. As I read through the views of whether, how and why this war had helped the Iraqis and the state of Iraq now, I once more returned to familiar territory in my own understanding of our wars in the Middles East. Blurriness. Uncertainty. An instinct to retreat from debate all together. When General Sir David Richards, chief of defence staff and former chief of international forces in south Afghanistan, watched The Great Game, which documents Afghanistan’s history from the nineteenth century to present day, he did so alongside 200 military and defence experts. Among those were a number of cadets who in most likelihood have a stint of service in Afghanistan ahead of them. Quite a responsibility to a long, complex and ongoing struggle in which many have lost their lives. Interestingly, I expected a play – as written by a playwright who, by nature, is more likely to lean to the liberal left – to be less palatable for those driving our forces. But the overwhelming strength of these plays was the broad insight that they offered to the last century-and-a-half, without coming back to any over-riding conclusion or judgement. Afghanistan is complex. Any play attempting to suggest a potential neat and ‘just’ solution would be a bad play, or in the realm of fantasy as opposed to politics. Nicholas Kent, Artistic Director of the Tricycle, aimed ‘purely to inform’, and this he does: the failure (on these terms) being that the plays do not purely inform, but engage, entertain, move and ignite debate too. This was not a straight history lesson: all playwrights monopolised the stage to inform us through intrigue, and often laughter. 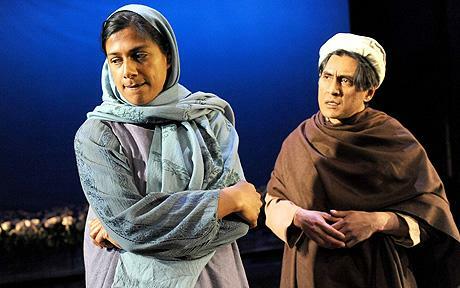 David Grieg, in Mini Skirts of Kabul, threw his own imagination straight to the heart of his play – literally – by having a modern woman ‘imagine’ herself into the UN compound where President Najibullah hid before being lynched by the Taliban. This was a stunning way of highlighting the contrast between the two worlds. As a bomb goes off the western woman shrieks and the President laughs simultaneously. In David Edgar’s Black Tulips we hear the changing voices of the Russian Military in the eighties. Cleverly moving back in time, we finish with their initial declaration to provide schools, education and health to Afghanistan. ‘What happens if we fail?’ asks the commander. Later, in Abi Morgan’s The Night is Darkest before the Dawn, we learn of the very personal sacrifices made by Afghan women in the fight for education through the story of one family, framed by a field of opium poppies. While being good plays in their own right, the power of the programme came through the cumulative effect of the plays. I trusted that if I was thrown one way in terms of insight, I would very soon be thrown in the other direction. And so I could listen all the more intently. Significantly, the programme finished with Simon Stephens’ Canopy of Stars, which focused on British soldiers. After a sweep through this huge history, the burden of the present day falls on these men’s shoulders. We finish with what we know. A sofa and a TV. This world is not Afghanistan. So what is important? Earlier we heard President Najibullah say: ‘Nothing matters any more’. What these plays show is that a lot matters to a lot of very different people. Lucy Shaw is an actress and playwright. She has just completed the Royal Court Young Writers Programme.